Ambulances in Merseyside and Cheshire are to have CCTV cameras installed to protect staff from violent attacks. 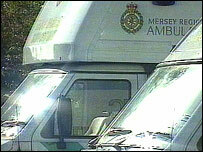 The move comes after 57 Mersey ambulance staff were assaulted in 2003. The state-of-the-art equipment, which is costing £100,000 to install, means if paramedics feel threatened they can press a button, activating the cameras. The hidden cameras record on to a special hard drive and are virtually tamper-proof. The footage can be used in court if an attacker is charged. Steve Bradbury, of Mersey Regional Ambulance Trust, said: "We have made significant progress in tackling the problem of violence towards staff. "Adding new technology to our vehicles provides additional protection for our crews and enables us to take action against any individuals who do attack our staff. "We also hope this will act as a deterrent to anybody who becomes aggressive onboard our vehicles." The system, codenamed Nemesis, is already on all new ambulances, and will be installed in the entire fleet within the next six months.